Export markets are critical for U.S. agriculture, especially for soybeans. In figure 1, total U.S. soybean exports (show in blue) are reported since the 2000/2001 marketing year. 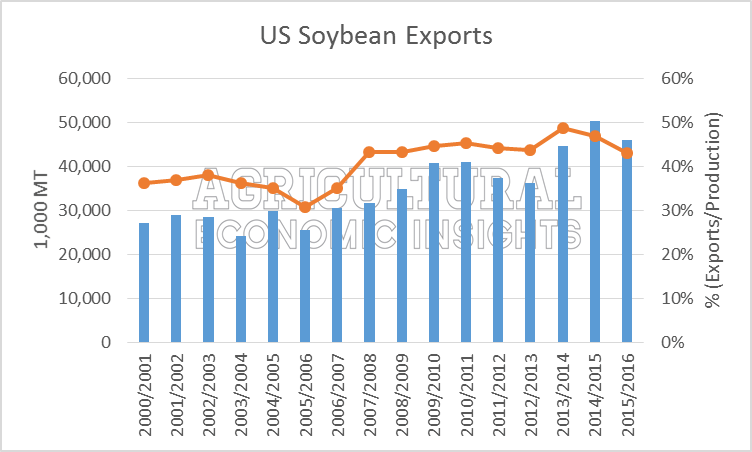 After several years of soybean exports around 30 million metric tons (MT), exports began to increase in 2008/2009 and reached more than 50 million MT in 2014/2015. Estimates for the current export year (2015/2016) are around 46 million MT, down 8% from the previous year. While exports being down is disappointing, it’s important to keep in mind the 2015/2016 exports would be the second-largest export year in more than sixteen years of data. Also show in figure 1 is the share of U.S. soybean production that exports account for (in orange, right axis). Prior to the 2007/2008 market year, exports accounted for less than 40% of U.S. soybean production. Since then, soybean exports have accounted for more than 40% production. In 2013/2014 exports reached a high of 49% of production. Figure 1. U.S. Soybean Exports (1,000 MT) (In Blue, Left Axis) and Share of Production Exports Represent (In Orange, Right Axis). Data Source: USDA FAS. A different story has emerged with U.S. corn exports. Shown in Figure 2, total U.S. Corn Exports have ranged between 40 million and 50 million MT for most of the data series. There were exceptions when strong exports reached more than 60 million in 2007/2008 and when soft exports fell to less than 20 million MT after the drought of 2012. Exports for the current year (2015/2016 market year) are reported to be nearly 42 million MT. These levels are 12% lower than the previous year and would be the fourth lowest in sixteen years. Exports as a share of total corn production (shown in orange, right axis), have trended lower over time. 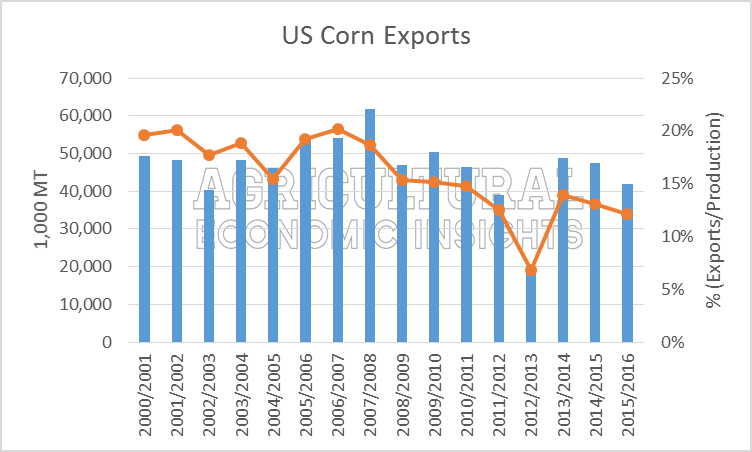 For several years exports accounted for 16-20% of total corn production but have recently been lower. Currently exports only account for 12% of total production. This would be the second lowest level, behind 7% observed after the drought of 2012. Overall, exports have been playing a smaller role in demand for the U.S. corn crop. Figure 2. U.S. Corn Exports (1,000 MT) (In Blue, Left Axis) and Share of Production Exports Represent (In Orange, Right Axis). Data Source: USDA FAS. When thinking about exports it is also important to consider what is going on globally. 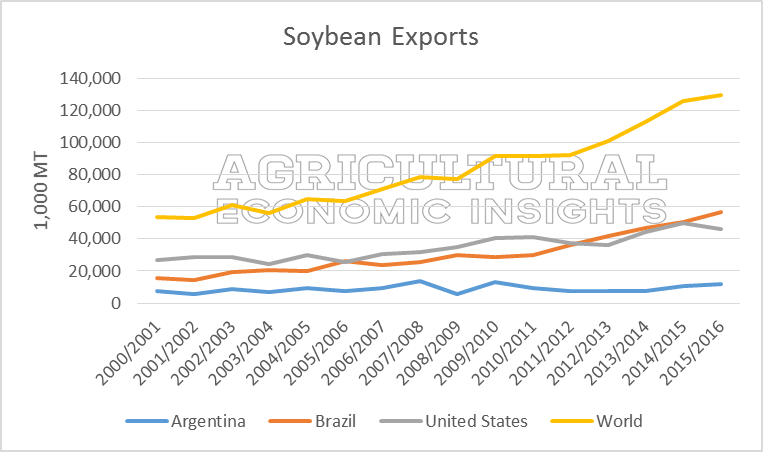 In figure 3, the exports of soybeans from Argentina, Brazil, the United States, and the World total are shown. World exports are estimated being at record levels in 2015/2016. At nearly 130 million MT, this would be 3% higher than the previous year. It’s worth noting that the growth in exports (not shown) in 2013/2014 and 2014/2014 was 12% annually. So while World exports of soybeans are increasing, the pace has recently slowed. 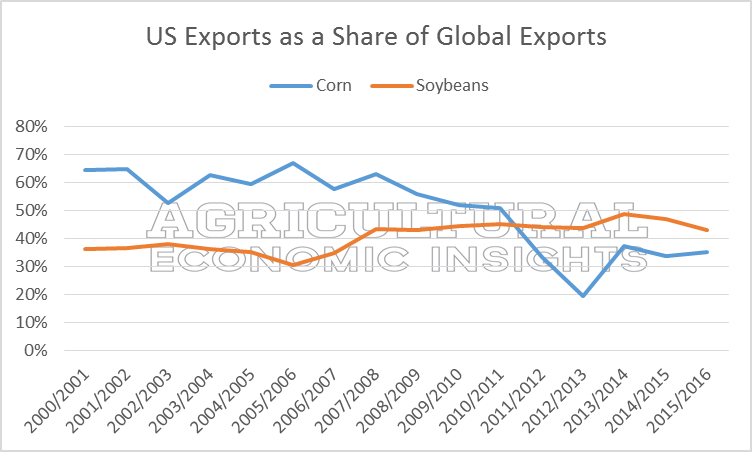 Another important observation to mention is Brazilian soybean exports. While the U.S. has typically exported more soybeans than Brazil, Brazil has out-ranked the U.S. on occasion in recent years. This is most obvious most currently (2015/2016) as U.S. soybean exports declined while Brazilian soybean exports expand. A trend that has certainly been enhanced by movements in exchange rates. Figure 3. Soybean Exports: Argentina, Brazil, United States, World Total. Data Source: USDA FAS. In Figure 4, corn exports from Argentina, Brazil, the United States, the Former Soviet Union (FSU) region, and the World are shown. One key-trend emerges. As the United States corn exports began trending lower (2007/2008), World exports began to increase. This lead to rapid expansion in exports from countries such as Brazil and the FSU region. The FSU regions, for example, accounted for less than 5% of the world total export prior to 2008/2009. In the most current year, the region will account for 16% of all global exports. Figure 4. 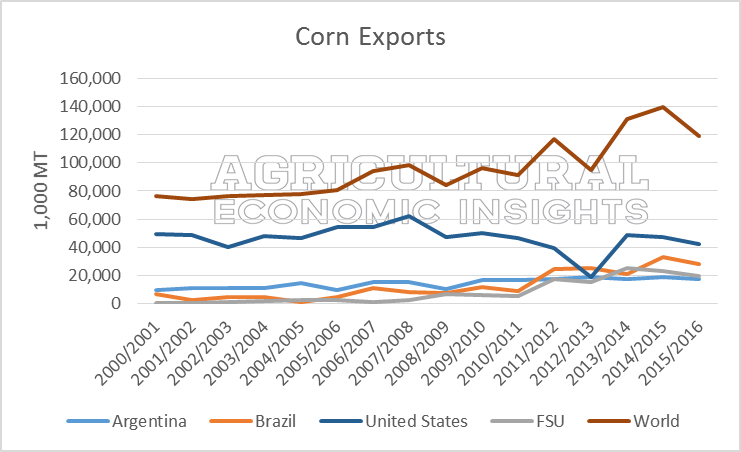 Corn Exports: Argentina, Brazil, United States, Former Soviet Union (FSU), and World Total. Data Source: USDA FAS. To consider how the U.S. accounts for total global exports of corn and soybeans, the data are presented in figure 5. U.S. exports of soybeans (orange) has increased over time and currently accounts for more than 40% of all global soybean exports. Corn, on the other hand, has reduced market share and has decreased from more than 60% to near 35% of total world exports. Figure 5. U.S. Exports of Corn and Soybeans as a Share of World Total. Data Source: USDA FAS. In short, the stories of U.S. corn and soybean exports are different. Soybeans exports have accounted for a largest share of production over time (Figure 1) and U.S. soybean exports have generally increased their share of the world export over time (Figure 5). Corn exports, however, have accounted for a smaller portion of total production (Figure 2) as U.S. corn exports have accounted for a small share of total world exports (Figure 5). Globally, total export of corn and soybeans have trended higher over time. This has been especially true for soybeans (Figure 3). Corn exports have been more volatile in recent years (Figure 4). As the global exports market has grown (total exports), the distribution, or market shares, have shifted over time. Brazil has increased both soybean and corn exports. The FSU region has also been a large driver in corn exports. Overall, U.S. corn and soybean exports are down in 2015/2016. These departures are important and significant, but not a disastrous collapse. This is especially true given the long-run trends that were also observed. Nonetheless, global corn and soybean production, coupled with macro-economic conditions (such as exchange rates), will be important to monitor in the coming year.